Farmhouse Copper Sink for the Kitchen. The most traditional sink style with a contemporary feel. This single basin copper farmhouse sink is great. It has a hammered finish giving it an indented scale like look and feel. The surface can be made smooth for a smooth finish. All the edges are rounded. It is finished completely around allowing it to be installed as a vanity counter top sink. It can also be under mounted as it was traditionally done with this design or it can be installed flush with the counter top. 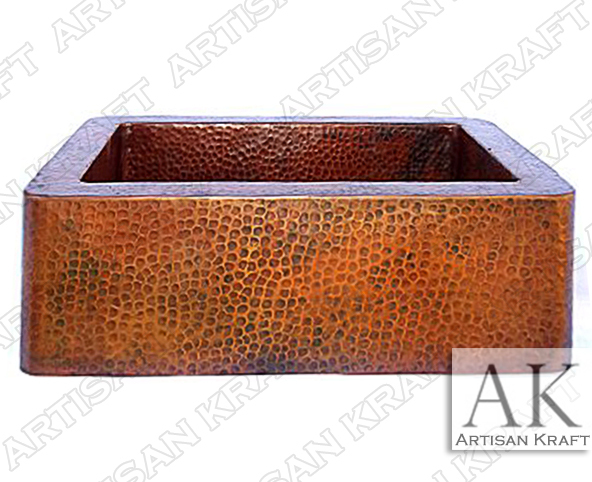 This is one of the many copper kitchen sink designs the we offer. Click on that link to view more. The style can also be made from stones like marble and limestone or travertine. Price: Please give a call or email us for a pricing.